Sometimes you just want to get things done. That’s where the short term goal setting worksheet comes in. The whole idea of this sheet is to prompt you to get one goal written down along with one desired outcome. Nothing more, nothing less. 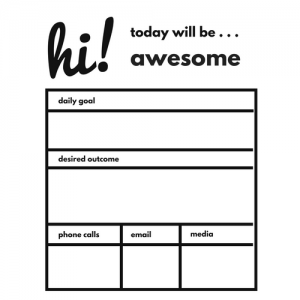 The sheet has a positive message at the top and three boxes along the bottom for phone, email, and social media links to help you get your goal accomplished. Example: Your goal for the day might be to make ten sales calls, and the desired outcome would be a thousand dollars in sales. You could fill in the phone and email sales links at the bottom. This sheet is perfect for personal use. Just print it out, fill it in and place it on your desk or table top where you will see it at a glance. Since it is big and bold, it will catch your attention and remind you of the task at hand.